So, this week saw the latest birthday visit to the studio of these gorgeous triplets. One I always look forward to! And this time, celebrating their FOURTH birthday! They’ve been in each year on their actual birthday, and before that at 8 months old. It’s lovely seeing how much they’ve changed each time they come in. Growing up fast! They usually bring in a favourite present or two that they’ve been given for their birthday – and this time was no exception. They were very excited to show me their new toys when they arrived. And these of course featured in one or two of the shots! There was lots of running around and squeals of laughter, along with some great cuddles for their mum! And they really got into the swing of dressing up and having a little song and dance at the end of the session. Have you ever had a dream and felt it could never in a million years come true? Me too. But when you really set your mind on something, dreams can become reality! I guess it was in the October of 2005 I had yet another one of “those” moments in the job I was doing at the time; you know, one of those days, nothing going to plan, just banging your head on a brick wall despite your best efforts. You feel like screaming rather loudly and walking out there and then. I didn’t walk out at that moment, tempting though it was, but I did think, “what on earth am I doing, spending the best part of my life feeling unhappy, doing such a thankless task” (as indeed I felt the role I was doing was). A feeling which was becoming more and more regular. If it hadn’t been for the smashing people I worked with, I’m sure I wouldn’t have stuck it out for the 5 years I did. One day something happened, I can’t even recall exactly what, but it was the straw that broke the camel’s back. I knew I couldn’t put up with it any longer. I rang Lee and asked him what he thought of the idea of my opening a photography studio? He didn’t bat an eyelid! Well he knows I can be very determined when push comes to shove and best to go with it than against 😉 So he just said, “Why not? Go for it! !” Bless him. We both knew leaving my job AND taking on the commitment of a premises was a pretty drastic move all in one go. But I’d been doing a bit of research as to the units Basepoint http://www.basepoint.co.uk/locations/romsey had to offer and because of their easy in/easy out clause, I knew I wouldn’t be committed to the premises for a long period of time should things not go to plan. We’d been doing photography in our spare time for a number of years, at clients’ houses and a few weddings for friends, so it was something I knew I really loved and couldn’t think of a more enjoyable way to spend my working days. So, having got the go ahead from his nibs, straight after that phone call I gave in my notice. Shortly afterwards we went to see Basepoint to secure a unit. Our premises would be ready in January, and I was lucky in that my boss allowed me to work a couple of months’ notice, rather than the usual one, so the timing was great. I left there at Christmas 2005; in the meantime I’d found myself a part time receptionist job to begin from January, to coincide with starting up the studio. Had to keep some pennies rolling in while I was getting it off the ground! Then it was all systems go – loads to sort out! A real toughie was coming up with a name for the new business, knowing that once you’ve settled on something you’re kind of stuck with it for the duration. Lee and I did a lot of brain storming and came up with all sorts of things, eventually settling on Romsey Fotografix. I’m probably more fond of the name now than when I first decided upon it. I ‘spose it’s the familiarity thing and relating it to the good times it’s brought me. The biggest drawback was, and still is, the spelling which seems to cause no end of confusion. Invariably Fotografix is spelt wrongly … Photografix, Fotographix, Photographics, and all sorts of other weird and wonderful varieties! In a previous life, I’d run a small graphic design business for several years, Lasting Impressions, so I was familiar with what running a business entails, although on a much smaller scale as I’d had no premises and overheads as such. Luckily our accountant at the time, who I’d known for years through working with him on the other company, gave us some great advice and generally helped us along our way with that side of things. A website of course was crucial. After a bit of Googling I found a provider who specialises in websites for photographers called Photium and I have kept with them until this day. They are great to deal with and it’s very straightforward to update and put my own slant on. Ideal. So having spent the best part of January 2006 sorting out the nitty gritty, it was finally time to move in! So this very date, 27 January 2006, we got everything in and set it all up. Then I took stock of the space that was to be my very own studio. Wow! It was a heady mix of emotions for sure … thrilling, exciting, nerve racking, daunting … you get the picture! I had to pinch myself as it all seemed a bit too good to be true! That very first studio space was in one of Basepoint’s smallest offices. It was a tight squeeze that’s for sure, as you can see from the pic! But we managed to fit in a backdrop and a few chairs, plus those trusty tubs which have travelled along the journey with me! It was a lovely light and airy space so worked pretty well. But …. eeeeek … there was still such a long way to go! I did loads of practice shoots with the help of my lovely family and friends. This gave me much needed valuable experience, as well as some pictures to put on the website and use in my advertising. I was learning a lot, discovering what worked best and what didn’t, both in the photos I was taking, and the way the studio was set up. Even though Lee and I had been taking pictures in people’s homes for a while, they had been of the more traditional and formal type, with the old style backdrops and the sort of “sit and smile” approach, as was still fairly normal at that time. However those types of images were a definite “NO, NO, NO” for my new studio. Oh indeed! Nothing formal about it! It was going to be fun, fun, fun all the way!! Fortunately it was a way of working that came very naturally to me. But nonetheless, lots to learn. Do you know what my biggest wake-up call was? A month or two in, a (needless to say) anonymous person sent me a very rude message via the website basically saying that my photos were awful – and that would be the polite way of putting it! I was absolutely mortified! Talk about give my confidence a rocking. I had thought I was coming along OK, but then again I was mainly still taking photos of family and friends who were, naturally, being very complimentary. That nasty comment in fact did me a huge favour. I took a good hard look at my pictures. Then I took a good look again at other more experienced photographers’ websites, plus those of some of the pros who are top of the game. Then another look at my own. And I thought to myself, “hmmm, maybe this person has got a point”. From that moment on I knew I had to seriously up my game else it might be game over! It made me realise that I must never, ever rest on my laurels or get complacent. There is always room for improvement and always will be. A philosophy that sticks with me to this very day. And so things were underway. Now it was just the small matter of finding some clients 🙂 I’ll save that one for the next instalment! What is a Fotoffer Gift Voucher? An AMAZING deal for photoshoots – that’s what! 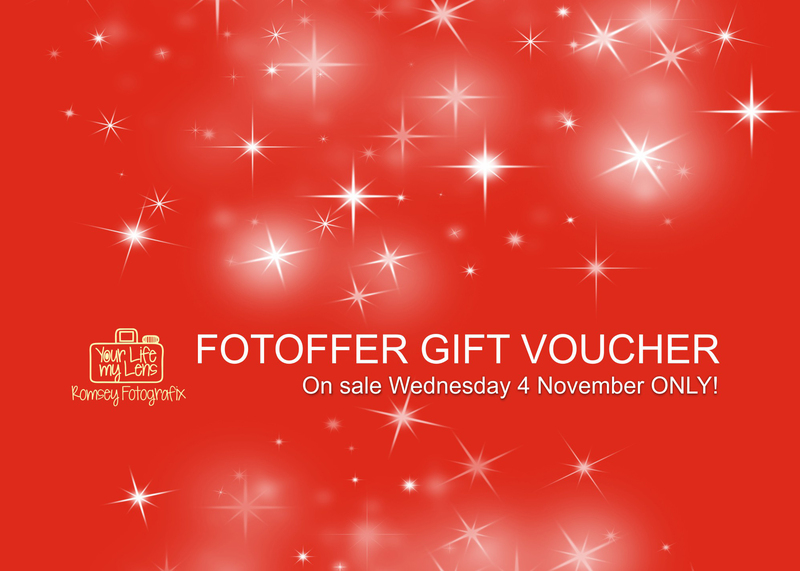 Yes, the Fotoffer Gift Voucher sure is an incredible deal – as many of you already know from previous years! And they’re up for sale again – FOR ONE DAY ONLY – Wednesday 4th November 2015! So you get products to the value of £125 for the incredible price of just £21! Yes, that’s right – only £21 !!! PLUS your Fotoffer Gift Voucher entitles you to a £35 discount on a premium canvas wrap or other selected wall display products if you so wish! No wonder they’re so popular – and perfect Christmas presents too! Fotoffer photoshoots have to be taken during January – April 2016. Full details and terms will be on the link to buy via http://www.facebook.com/RomFotografix once they go on sale. If you’re not on Facebook – don’t worry – I’ll also put the link on the Homepage of my website – for one day only – Wednesday 4th November 2015! And please share with your friends – thank you! !